By Carol Pass, Chair, East Phillips Improvement Coalition, EPIC. In spite of their continuing rhetoric about ‘equity’, the City of Minneapolis is rapidly moving forward with their long-hidden plans to intensify the air pollution and traffic congestion problems of what has become known by area residents as the “Intersection of Death”, 28th St. and Cedar Avenue South, with its dangerous, toxic and foul-smelling air, its numerous massive and unsightly trucks, its impossible traffic congestion and its many nearby families with children and several ethnic daycare centers. The Ways and Means Committee of the City Council voted Monday, June 15th, 4 to 1 with one abstention to approve the intensification of these problems and on Friday, June 19th, in a 10 to 3 decision the City Council followed suit, in spite of the many letters, petitions and loud protests of your neighbors and many area organizations. 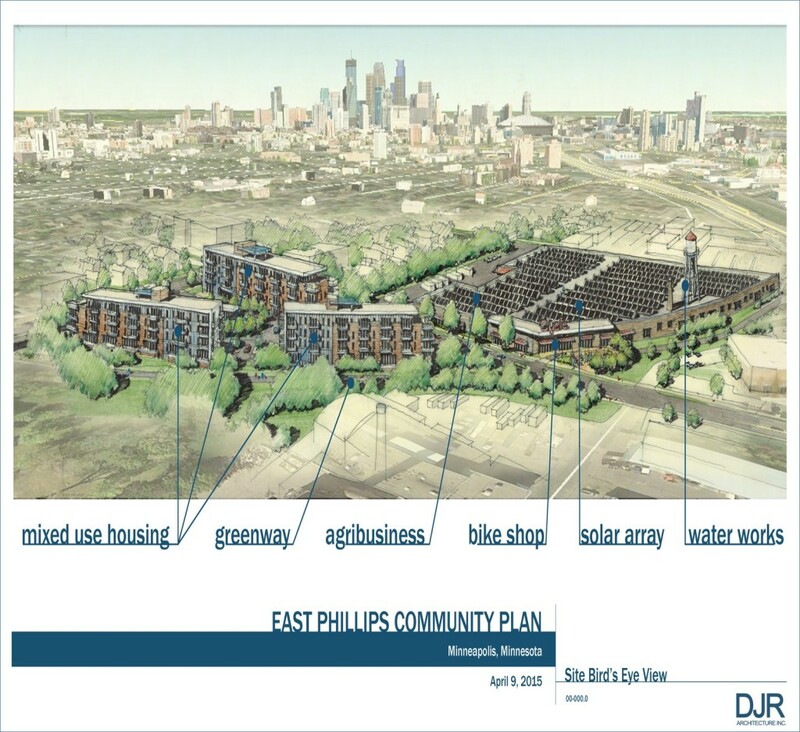 Last November the East Phillips Improvement Coalition, EPIC, voted to begin a final campaign after all our others to remove the existing major polluting industries from East Phillips, i.e. Smith Foundry and the hot asphalt plant, Bituminous Roadways, and replace them with light industry and residential housing along the Greenway, changing this area to a place worthy of Highway 55 as the City’s International Gateway from the airport. Residents’ motivation came primarily in response to new science that has shown dramatically that all of this pollution is far worse for children than has been known in the past. ADHD and asthma recently figured far more heavily in the childhood health impacts resulting from these industries. EPIC, to implement our vote, began pressuring these industries to move and started building a movement to de-industrialize this area around the “Intersection of Death”. It was at that point that the City planners and Public Works came out of the woodwork and revealed their nearly completed and never-before-seen plan to add to the polluting industries by buying the Roof Depot site at 1860 East 28th Street and moving the City Public Water Works facility there, bringing to this already congested area 68 more massive trucks, 24 of them diesel, plus numerous other oversized vehicles, back hoes, bulldozers, etc. and also all the vehicles needed to bring 100 employees to and from the site for work, none of whom live in Phillips. This plan would add to the polluting industries, inflicting on us the opposite of the de-industrialization we had hoped to achieve. The City acknowledged to us that they had been planning this behind our backs since 2001. They had completely ignored telling the community about this, ignoring all community engagement for more than a decade. Had we not begun an “anti-pollution/protect the neighborhood children” effort, some of us think we never would have known about this until the giant trucks began rolling through the neighborhood near the completion of the project. Core Principles of Community Engagement. How are we to understand the ‘bad faith’ of the City’s concealment along with its failure to inform the neighborhood residents for years and then only in the last few months? How are we to understand their refusal to carry out the City’s own code of ethics, stated in part here? What does it mean that the City ignores its own documents, which are to insure ‘equity’ in community engagement and especially with regard to one of the poorest and most diverse neighborhoods in the City? We are responding in the only honorable and appropriate way, to fight this travesty of procedural and environmental injustice. We have a long and deep tradition of working together to battle industries, businesses or individuals who wish to locate industries in Phillips, which would harm or disproportionately burden this population of low income, struggling immigrants, refugees and people of color, roughly 50% who are children. Recall that the neighborhood stopped the County from locating their Garbage Transfer Station in East Phillips in the late 90s; stopped the wood burning Midtown Eco-Energy plant in East Phillips in 2007 to 2009 when a major increase in asthma was found to be the outcome of this industry; and again stopped Xcel energy’s overhead high-voltage power lines and compelled them to be buried underground in 2010 to 11, when we learned of an up-tick of childhood leukemia from these lines. Who would have asked these health and justice questions if we had not? Doesn’t the City Council and planning department have some responsibility to ask them? Where have they been in any of this? Protection and seeking to reverse the damage of low incomes and racial prejudice against these families and children has guided the actions of EPIC since its inception. We began this process by referring to the City‘s own stated “Goals and Strategic Directions of the City of Minneapolis” created by the Council and Mayor, to get a sense of direction. Living well: Minneapolis is safe and livable and has an active and connected way of life. All neighborhoods are safe, healthy and uniquely inviting. Great Places: Natural and built spaces work together and our environment is protected All Minneapolis residents, visitors and employees have a safe and healthy environment. We concluded that an Urban Agribusiness would be the best fit for Roof Depot building and would implement all the relevant “Goals and Strategic Directives” of the Council and Mayor. We requested that Dean Dovolis work with us to create an area plan for the community vision. We then met at an EPIC community meeting that was widely publicized to vote on the plan. The vote passed unanimously. You can see the basic elements in the picture at the top of this article. You can see it includes a large solar array to provide energy to power the agribusiness located in the Roof Depot building. It also includes residential housing and a bike shop on the Greenway. Safe, Livable and healthy– It would provide fresh, locally grown food in all seasons with almost no pollution, not even from cars, people could walk or bike to work. Elimination of economic disparities and racial inequities– would provide lots of jobs that Phillips residents could qualify for and families will not need to own a car to get to work. There are almost no adequate jobs near by for this population..
Focus on areas of greatest need-This is an area of greatest need. The truth is that for the first time we now have some real amenities, the Park Center and the soon-to-be Swimming pool, but we did all the fundraisers and raised almost all the money ourselves, contrary to many other neighborhoods. We still have deeply impoverished families and many are currently spending an enormous amount of money and time to travel great distances to jobs. Environmental Justice– All Minneapolis residents should have a healthy and safe environment, This proposed development will provide that. East Phillips has used very little City money to pull itself up by its bootstraps. We still have photos from a huge party Mayor Belton threw for us years ago for our work at restoration of East Phillips, done with so few resources and we had only just begun. She handed EPIC a huge check for $50,000 and persuaded Honeywell to do the same. It all went into filling vacant lots with housing. That was the ‘hey day’ of City support and collaboration with the neighborhoods. We have never received so much support since, and much opposition. The community has asked, but has not received and so have done much on our own. Given the lack of support, we have only asked to be left alone and, in that setting, have done wonders. The Park Building, the coming Swimming Pool, the soccer fields, the two apartment buildings, 28 town homes, 30 single family homes and many sport teams testify to that. We have heard little from the Downtown Government for years. This is the first City involvement in memory and it comes only as something damaging, future destroying, with no community engagement to speak of and a project concealed from us for years in which we have had no say. It is an example which demonstrates a complete failure on the part of the City to even acknowledge the City’s “Goals, Strategic Plans,” claims to be concerned about racial or economic equity or even a nod toward serious community engagement as espoused in the documents created by the City itself, ones to which we in East Phillips are trying to adhere. It is time for the City to put its money where its mouth is or to pull out and leave us to continue to rebuild East Phillips by ourselves as we have so beautifully and with so much hard work done in the past. Please end this quest to undo so much we have done and fought for. We will not back down from insisting on better treatment and respect for the goals, hopes and future plans of East Phillips’ people. This plan included here is what EPIC’s community engagement has told us the community wants… This is what the residents voted for …This is what we insist on…a much better future than the grim one the City Council vote has set before us.